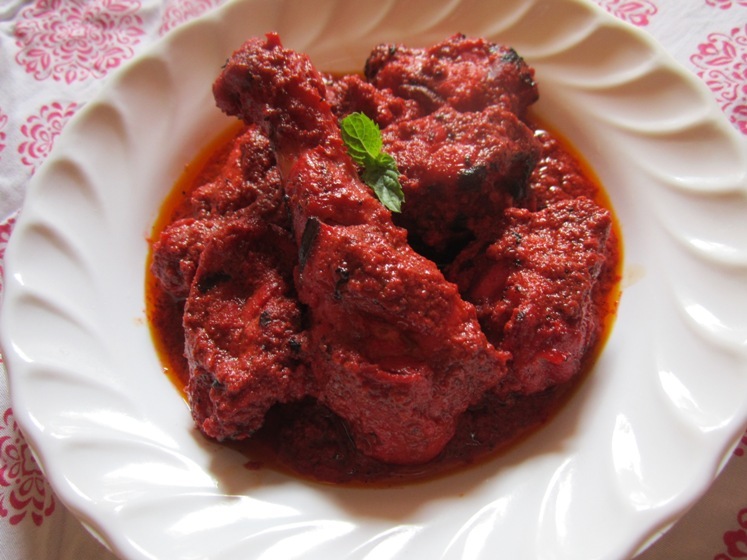 Hello buddies today I am sharing a delicious version of the tandoori chicken recipe. 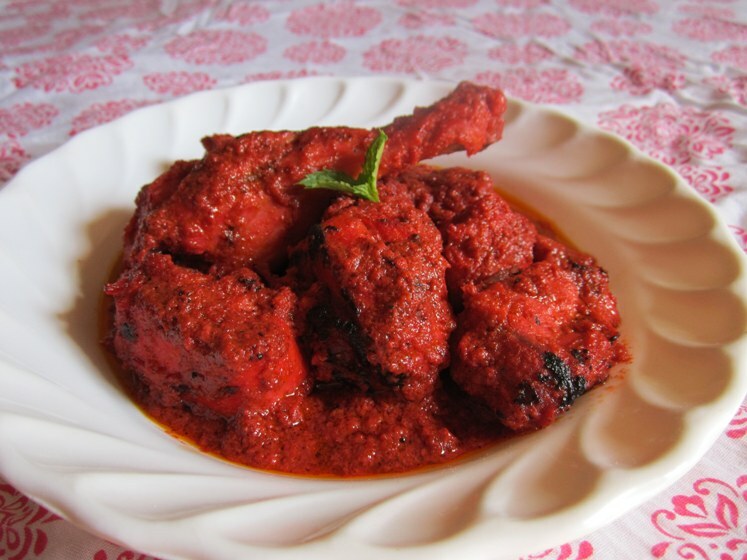 This recipe has juicy and succulent pieces of grilled chicken cooked in spicy gravy. 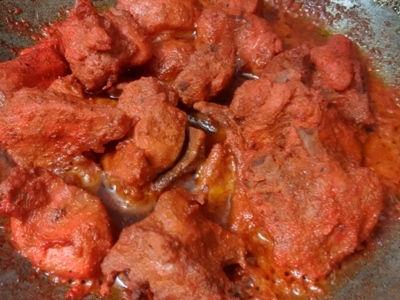 Usually, tandoori chicken is prepared in clay oven. 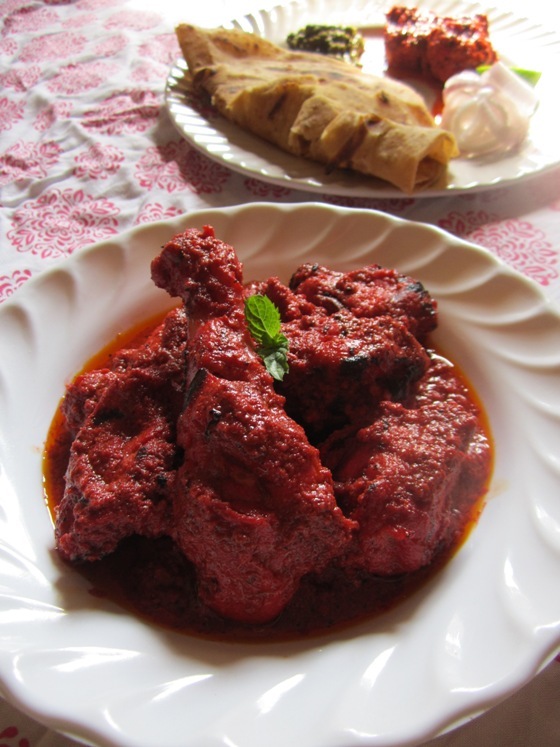 But with this recipe you can learn to make tandoori chicken without oven on your stove top. 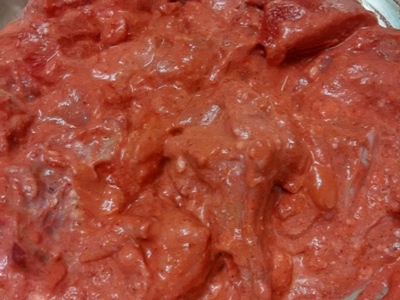 It is also known as tandoori chicken masala gravy. You might be wondering whether I used store-bought tandoori chicken masala for the marinade. Well, I didn’t! Instead, I chose to use the usual Chicken Masala of Everest brand. 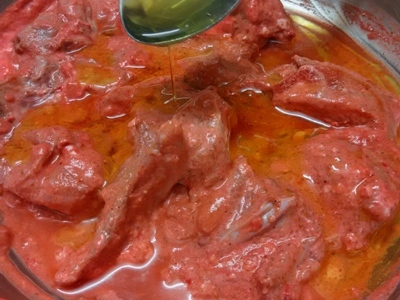 So you will see that this tandoori chicken marinade recipe lends a unique flavour, which makes this recipe stand out from the conventional tandoori chicken recipes. 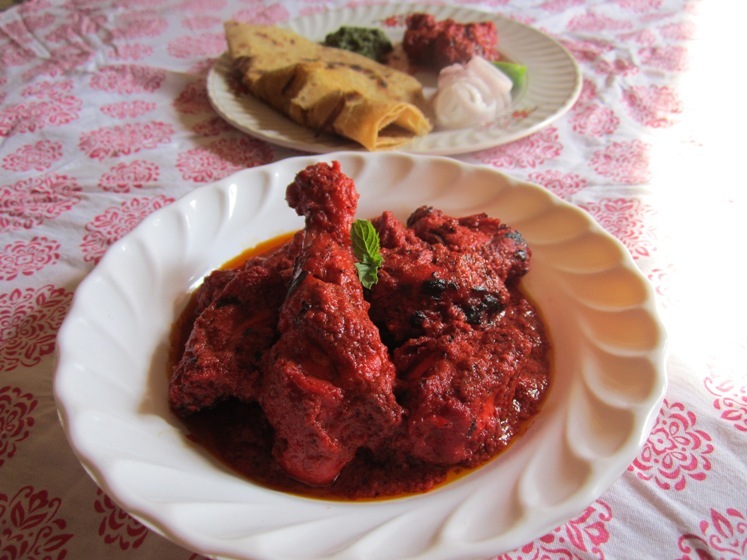 You can have this tandoori chicken curry with lachha parathas. 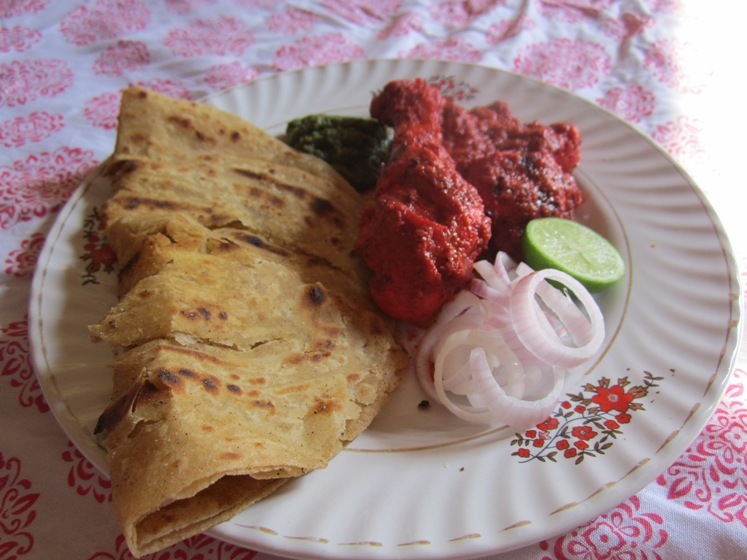 The gravy is extremely delectable and everyone in your home would surely enjoy dunking bits of parathas in it and relish this easy chicken tandoori recipe with great fervour. 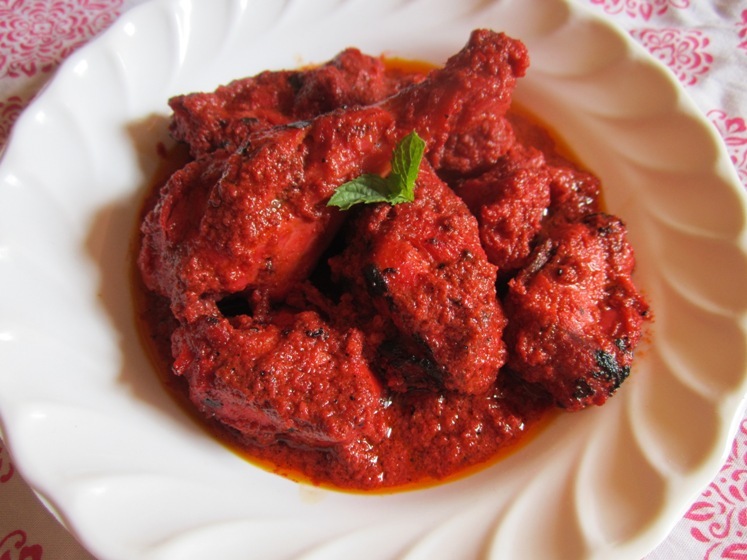 This tandoori chicken has the restaurant-style appearance, flavour and aroma. Since the chicken bits are grilled over the open fire of the stove, they have the typical char and grilled marks. 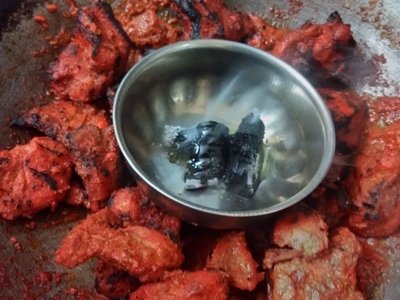 In the end, I have tempered the entire tandoori masala chicken by pouring oil over the piece of red hot charcoal for the typical smoky flavor. 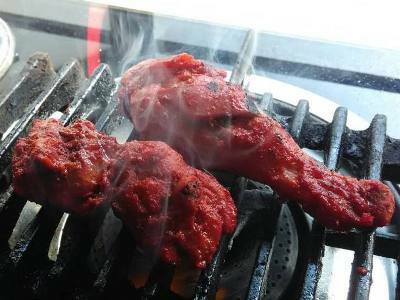 This recipe of tandoori chicken yields 2-3 servings. For the purpose of measurement, 1 cup = 250 ml. Let’s begin! In a bowl, take the chicken. 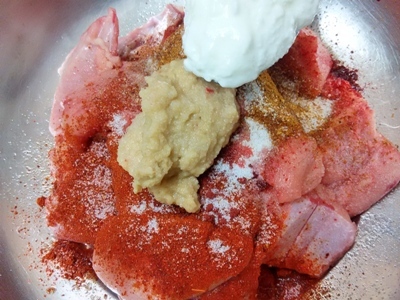 Add in the yogurt, red chilli powder, Kashmiri red chilli powder, ginger, garlic, chicken masala and salt. Mix everything well so that the marinade covers the chicken well. Try using your hand instead of the spoon to mix the ingredients. Now add the oil and mix everything once again. Cover the chicken and let it marinate for 2-3 hours. Heat the skillet on medium flame and add in the chicken along with the marinade. The chicken will release a lot of water at this stage. Cook the chicken on medium heat till its done and the gravy thickens. This step takes about 12-15 minutes. When the chicken is done the oil will come on surface and will look like this. Pick the chicken pieces and let the gravy drain properly into the skillet. Grill the chicken on direct flame of the stove. I placed an iron grill over the stove to place the chicken pieces on. Make sure the iron grill is very hot before you place the chicken on it. Put the grilled chicken pieces back into the gravy and give it a good mix. Heat a piece of charcoal over the flame till it turns red. Place a small bowl in the middle of the skillet and transfer the hot charcoal into the bowl using a pair of tongs. Pour 1 tsp of oil over the charcoal and immediately cover the skillet with a lid to trap the smoke in. Open the lid. 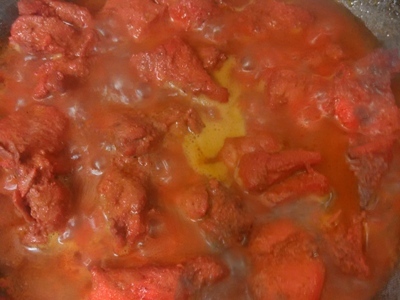 Chicken tandoori curry is ready to serve. 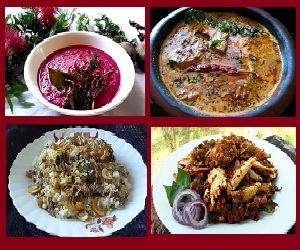 Serve hot with rotis or parathas. Enjoy!